DEAD CENTRE / SEA WALL, two plays, one each by Tom Holloway and Simon Stephens, a Co-production presented by Red Line Productions and Red Stitch Productions, at the Old Fitz Theatre, Cathedral St, Wooloomooloo, 20 Oct - 14 Nov.
DEAD CENTRE by Tom Holloway, and SEA WALL, by Simon Stephens, two monologues, are presented as a Co-Production from the Red Stitch Actors Theatre, Melbourne, and Red Line Productions, at the Old Fitz Theatre. SEA WALL was written by contemporary British playwright, Simon Stephens (ON THE SHORE OF THE WIDE WORLD, PUNK ROCK), in 2008. A monologue from a Man, a father (Ben Prendergast), telling of the loss of a child and the aftermath, toll, on he and his family. Red Stitch commissioned Australian writer, Tom Holloway (BEYOND THE NECK, AND NO MORE SHALL WE PART), to write a monologue as an accompanying play. With the permission of Mr Stephens - the authors are friends - Mr Holloway wrote DEAD CENTRE (2015), a piece concerning the breakdown of an English woman (Rosie Lockhart), in Australia. The two actors perform, what the Red Stitch prefer to call monodramas, with a disarming intimacy, directly to the audience - they take, collectively, just an hour to give. The conceit of the writing have the characters acknowledge our presence and we are beguiled into a relationship that can be costly to our empathy. My night, with them, became an extremely moving one. Red Stitch present the work within a very sophisticated aesthetic - a mesh-screen which captures projected images of the sea and shore (Digital Designer, Katie Cavanagh) and also allows us to see through it, to the presence of the actors, when they are not engaged with us at the front of the stage - the Set and Lighting Design is by Matthew Adey, who, also, was in charge of those elements in GROUNDED, another superlative work presented by Red Stitch, earlier this year. There, too, is an atmospheric Composition and Sound Design, by Ian Moorhead. All sensitively Directed, by Julian Meyrick. My bug-bear with much of my theatre experiences in Sydney, for some time, has been the seeming avoidance of most of our plays, and especially, productions of them, to honestly deal with social, cultural and political confrontations, in full-on human depth, that rather, instead, elect to edit them out, or soften them, or worse 'piss-take' them - there are exceptions, of course, to prove my 'rule': e.g. THE BLEEDING TREE- so it was with welcoming pleasure that I embraced the tone of this production. Two of the most satisfying nights in my theatre going this year have been presented by this Melbourne company, despite, the dreaded writing formula of the monologue, story-telling go-to preference of so many of our contemporary writers. 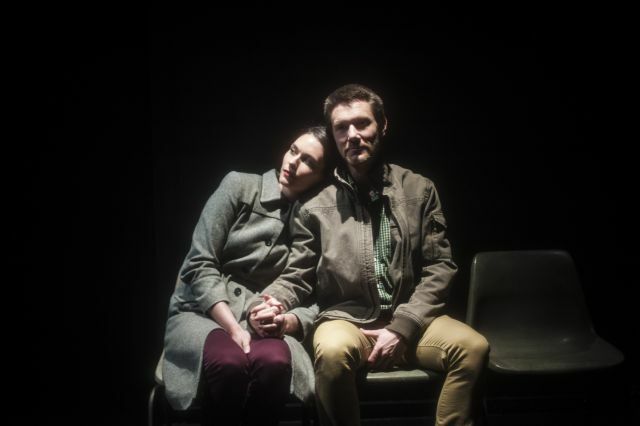 DEAD CENTRE / SEA WALL has a stellar theatrical impact given by Ms Lockhart and Mr Prendergast, and as I encouraged you to attend GROUNDED, so do I, this production at the Old Fitz. Go, and have a rare shared evening as a respected 'adult community' in the theatre. I'm afraid I thought this was deadly theatre. The main problem was the writing, which was vacuous and cliche ridden. The writer even had to resort to quoting Shakespeare (King Lear) to try to give it some significance. That just made it pretentious.